When I first started making it, I would boil a whole chicken with celery, carrots and onions for seasoning and then shred the meat for the salad. Now I have learned ever so much more about flavoring chicken especially that roasting the chicken breasts brings out more flavor, loads more flavor. No more boiled chicken meat for salad for us, Oh no! 2. Wash and dry chicken breasts. Rub chicken breasts with olive oil and place on cookie sheet. Liberally salt and pepper chicken. 2. Bake for 30 to 40 minutes until chicken is done (160 degrees F). Set aside and allow to cool. 3. When the chicken is cool enough to handle remove the meat and dice, discarding skin and bones. 4. Add celery, red onion and mix in enough mayonnaise to taste. Sprinkle in season salt to taste. Yum! It's lunchtime here and this looks just about perfect! Hey, I saved you some:) Come on over! Looks pretty yummy. I'm almost sorry I've eaten lunch already, lol. delish! Hugs and wishes for a beautiful week! This is what we're having for dinner! Yum! that looks really good! I bet it would be great on croissants! Just finished dinner. I wrapped them in butter lettuce and it was spectacular! Thank you Evelyn! Looks so delicioius yet so simple! Stopping by from the blogger party blog hop. I so want to make this now! Looks amazing & it will be perfect for when my daughter is out of school needing to lunch at home! @ DearCreatives.com come link up your recipe if you like! Love the flavor tips! Thanks so much for linking up, we love chicken salad, too! You are so right. Chicken salad is great on a hot summer day. My fav way to eat it is to hollow out a tomato and add a big scoop of chicken salad. Thanks for linking! That sounds good:) As soon as I have fresh tomatoes in my garden I am trying that. 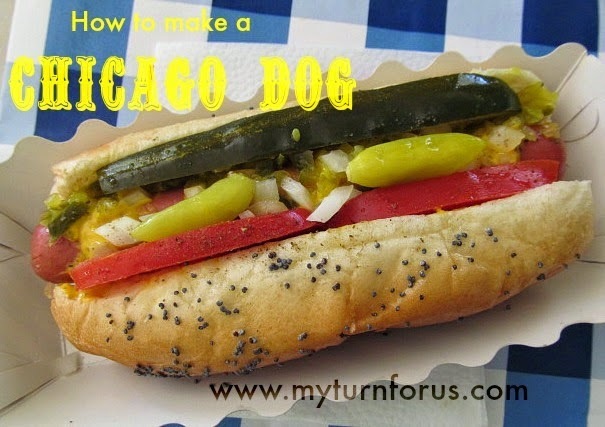 Just the right summer food… looks fantastic… I'll be over for lunch! hehehe! That is the perfect dinner for a hot summer night! On my to make list! Thanks for sharing at Scrumptious Sunday! I am featuring this recpe this week! congrats! Yummy! Thanks for linking this to Things I've Done Thursday! I cook my chicken in the oven pretty much the same way. Anymore I use boneless chicken. Thinking maybe the bone gives it more flavor. 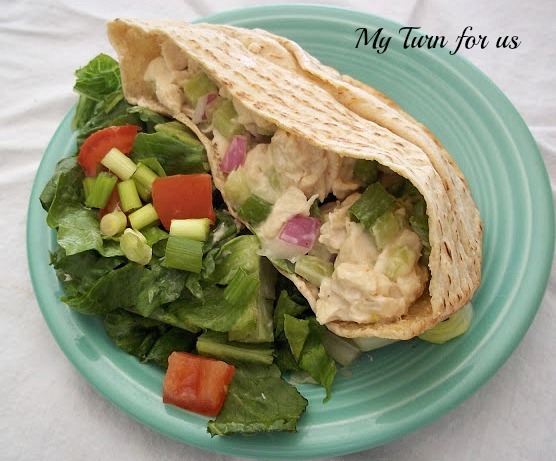 I love pitas and it's one of our favorite summer meals. Thanks for sharing with Share Your Cup. Yum! I just got some pitas so this would be perfect! Thanks for sharing! What an easy and tasty sounding recipe! Thanks for sharing on Tout It Tuesday! I can't wait to make this! Thanks for linking up to the All Star Block Party! This chicken salad looks really good. Thanks for sharing at Showcase Your Talent Thursday! Chicken anything is always so much tastier if you cook it on the bone first! And usually cheaper, too! Just stopping by from the GRAND Social! Glad I stopped here before going to the store today! I love chicken salad. I usually use a rotisserie chicken. I like to make it with pecans and grapes. Delicious! Man oh man, am I hungry now. And it's the middle of the afternoon! This would definitely hit the spot on a hot evening like we've been having. Will have to give it a shot (using white onion instead of red, as it's what I have on hand, though I do love the red more). Thank you for making me hungry…I mean, thank you for linking to GRAND Social! Happy Monday! I've only recently become a chicken salad lover. Why only recently? I have no idea. I think someone somewhere along the line made one that did not taste good at all. But now, I love it…especially when it includes red onions! Thanks for linking this one, too, to GRAND Social! I love the simple and easy recipe. 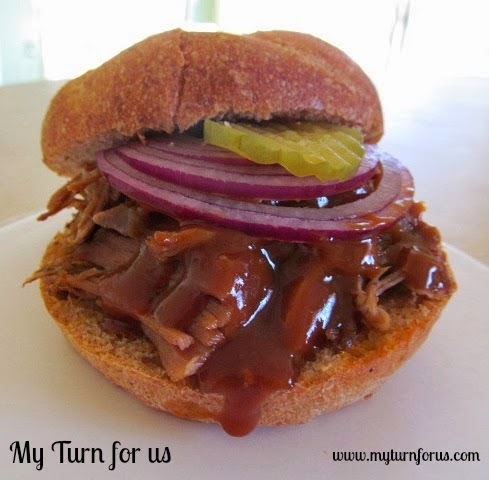 Thank you so much for linking up to Tasty Thursdays last week. Hope to see you again this week!! My husband would love this, Evelyn! Thanks for sharing at Saturday Dishes. Pinned! Looks awesome, Evelyn!! 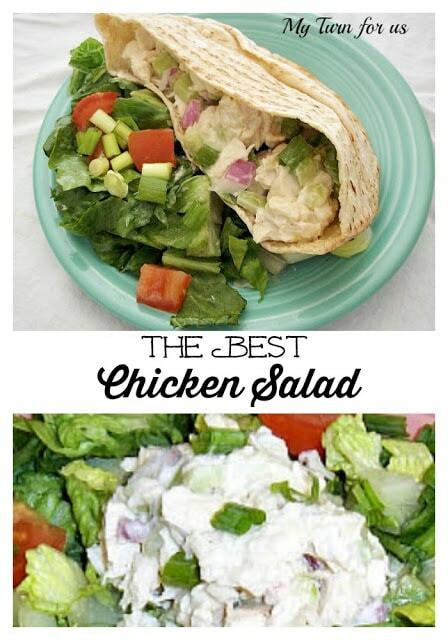 We love chicken salad! Sending some foodie love your way!